So earlier this month I was offered a trip to the beautiful city of Nice in the French reviera at the end of April only shortfall was It was for a half marathon. And this time not in a boat but by foot. I havent run since I was about 16 before I got a car I did the 5km Solent Saunter once, so this is going to be a challenge. So all set with my Keen A86’s, spandex pants and Garmin Forerunner the challenge was on. My maiden run was with Tom Egan of Salmon Leap a war hourse and absolute legend. A 5km loop from the club house pushing my legs through the pain of the jog as I reentered the club house gates I could feel my quads and calfs cramping with every step this is going to be one of the toughest challenges ive done so after 5 days of pain with every step and stairs feeling lie mountains out I went again this time with Tom And Kevin Lynch we pushed out the course to a healthy 9km I managed to both push the pace and had fuel in the tank for the final km things felt good. I awoke the next morning legs feeling great so decided to go for a gentle jog keep the legs moveing adding another 8km to the bag. So at the end of the first weekish id run a total of 37km with the race 21km ive a long way to go but staying injury free and healthy will stand me in good stead to rack up the miles over the coming weeks. 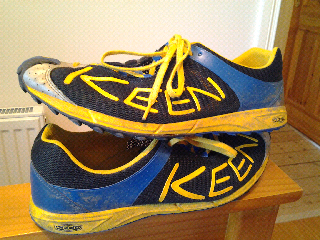 Thanks to Keen Europe for the A86’s my running shoe of choice, comfy lightweight and supportive makes running smooth and steady with a great antislip sole any surface feels grippy and firm.